SAN PEDRO CUTUD, Philippines — Thousands in the heavily Roman Catholic country of the Philippines looked on as their neighbors engaged in self-flagellation in the streets, while others volunteered themselves to be nailed to the cross for the Good Friday holiday. The tradition, while criticized by local Roman Catholic leaders who would prefer to see “good works” from followers rather than punishment, has reportedly been carried out for decades. And although various Filipino cities observe the practice known as “Senakulo,” Barangay San Pedro Cutud is the most known for the ritual. According to the Associated Press, the whippings and crucifixions are carried out with “the belief that such extreme sacrifices are a way to atone for their sins, attain miracle cures for illnesses or give thanks to God.” Some walk the streets beating their bare backs bloody while others gather to watch the men who volunteer themselves to be nailed to the cross. 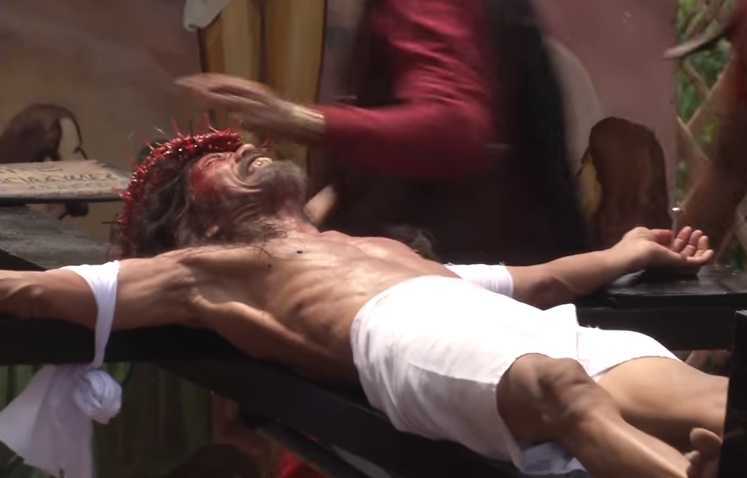 This year was no exception, as many flogged themselves with bamboo sticks in reenacting the suffering of Christ, and over a dozen men were crucified. “You actually feel good, because you know some of your sins are being forgiven,” Joel Yutoc, 23, told the AFP. Ruben Enaje, 55, has given himself to be nailed to the cross in San Pedro Cutud each year for the past 30 years. He says that he began the ritual after surviving a fall from a three-story building in the 1980’s. Enjae said that for nine years, he used the crucifixion to seek healing for his daughter’s asthma, and another nine for his wife, who has a lump on her jaw. He said that this year, he was offering up prayers for those affected by the Brussels bombing and others affected by ISIS. Ronald Lazaro, Crisaldo Macaspac, Bernardo Calosa, Ramil Lazaro, Victor Caparas and Byron Gopez were also crucified in San Pedro Cutud. “Faith healers” Michael Katigbak, JonJon Tanael and Precy Valencia were nailed to crosses in Bulacan. “That’s some kind of extreme sacrifice,” onlooker Renato del Carmen, 43, told reporters. As previously reported, in January, an estimated half a million Filipinos participated in the annual Feast of the Black Nazarene procession, seeking to touch a wooding carving of Jesus carrying the cross out of their belief that it possesses healing powers. The event takes place every January 9th in Manila. Those who observe the occasion, which includes men, women and children alike, usually walk the streets barefoot as a gesture of reverence toward the statue. Some carry cloths as they seek to press up against the carving. The vast majority of Filipinos—approximately 80 percent—are Roman Catholic. An estimated 2.8 percent of the population profess to be evangelical Christians.